With the internet changing at such a fast pace when new technologies become available that can help your business outperform the competition you really need to get on board. The need to outperform competition is more important for Estate Agents than most professions due to the high levels of competition within such a close proximity of each other. The fact is you can stay with what you are currently doing and pretend that your website will be fine and your competition won’t try and out do you or you can positively engage and integrate emerging technology into your online marketing strategy, increasing your company’s overall marketing footprint. So what does your website need? With the huge increase of smartphone users in the UK this is a no brainer, as more and more people will be using the web on their mobiles, your website will need to look good and be easy to use through a mobile phone. A potential customer may be walking down the street and notice a house for sale that they quite like and want to know more about. In the past they would have had to call up the agent or waited until they got home to check the agencies website. 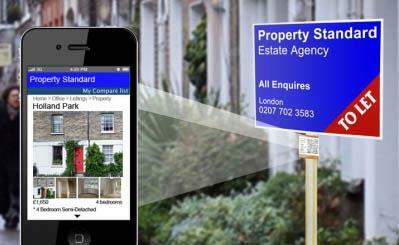 Now they could just pull out their mobile phone and with a QR code on your board you can to make it easier and more fun for the enquirer to view the property on your mobile website. This would take them straight through to the property on the website, giving them the information of the property as well as all your contact details. Smartphone and mobile search is only going to grow over the next few years so don’t miss out on this great opportunity. What is considered to be the powerhouse of online marketing at the moment, Facebook and Twitter can draw in huge amounts of potential business. With Facebook having over 37 million users in the UK alone and Twitter having over 15 million, marketing through these social channels are a must! Not only will it drive traffic to your website but builds credibility for your Estate Agency (if used right). Blogs or news features have been around for a long time and still in 2011 it is a crucial part for your online success. Let’s consider some of the reasons having a blog will benefit your estate agency website. If someone has read an article on your website and enjoyed it, they are more likely to come back and read more articles. Writing articles that are useful and interesting will encourage website owners or ‘bloggers’ to link to the article. This will improve your rankings within Google. As you already know your website needs to be optimised for Google. That is unless you don’t want people to find/come to your website. Saying you don’t care if Google can find you is like saying you don’t care if you’re customers are able to call your business, find your office or sell their properties with you. All business’s benefit from search engine optimisation and it should be one of the top things to consider when building a website. Everybody loves watching videos and having videos on your website is an easy way for customers to learn about what you as an estate agent have to offer. Videos are a great way to be seen and remembered by potential customers. It also will keep users on your website for longer. Having videos on a website will not only help your website but can also been seen and found on popular video sharing website such as YouTube and with YouTube having over 32 million frequent users in the UK it has the potential to draw in huge amounts of traffic to your website.